The head of the largest climate change study ever undertaken in Canada says the Arctic sea ice is thinning faster than expected. "It's happening much faster than our most pessimistic projections," said University of Manitoba Prof. David Barber, the lead investigator of the Circumpolar Flaw Lead study. A flaw lead is the term for open water between pack ice and coastal ice. 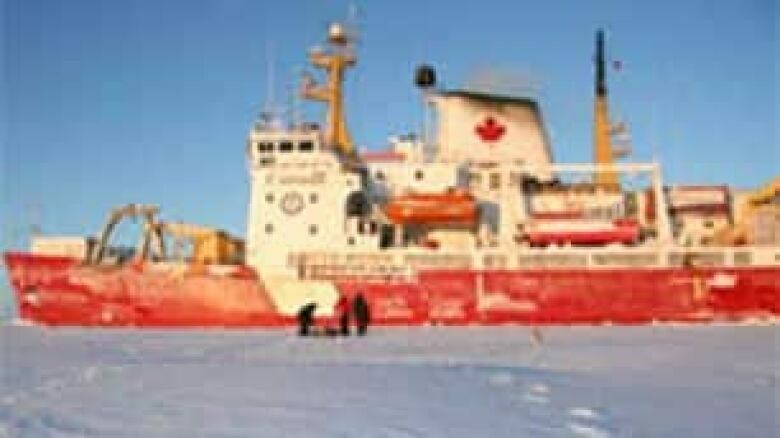 The study aboard the Canadian Coast Guard research ship Amundsen began in July 2007 and involved 370 scientists from around the world. It was the first time a research vessel had ever remained mobile in open water in the Far North. Barber called the expedition climate scientists' "first opportunity to look at what the Arctic Ocean looks like in the middle of winter." They found that Arctic sea ice is disappearing faster than scientists expected. "We're seeing it happen more quickly than our model thought [it] would happen," said Barber. "It's an early indicator of what we can expect to happen further south," Barber said at a news conference in Winnipeg. "We can expect things to happen faster here, too." Barber said the human impact on climate is being superimposed on the natural variation in climate and temperature. The result is more variability in the climate: warm spells are getting warmer and the cold spells are getting colder. The researchers also found that storms have become more frequent in the North as the sea ice thins. "There are more storms now because there's more open oceans and those storms are having a dramatic impact on the sea ice," said Barber. The storms drop precipitation, mostly snow, on the sea ice and the snow insulates the ice, keeping it from growing thicker. Barber said much of the research undertaken on the Amundsen involved measuring the effects of changing climate on the Arctic. "We know we're losing sea ice. What you're not aware of is … what the consequences of this change are," said Barber. Barber compared the impact of losing sea ice in the Arctic to the loss of trees in a tropical rain forest. The Arctic sea ice isn't just a cap on top of the ocean, Barber said. "The sea ice breathes," he said. "It pumps carbon dioxide in and out." The researchers also found pollutants in the sea ice. "The Arctic is not as pristine as you would like to think it is. It's actually a dumping ground for a lot of contaminants," he said. The Circumpolar Flaw Lead study was not only the largest climate study ever undertaken in Canada, Barber said, but the biggest study conducted during the International Polar Year. The Canadian government provided $156 million in funding for the research during the International Polar Year from 2007-09. The expedition involved 10 science teams, studying every aspect of the Arctic environment, from microbes to mammals to weather systems. Barber anticipated that each one of those teams would have at least 10 papers published in peer-reviewed journals. Barber also emphasized the role that traditional aboriginal knowledge played in the research, especially in mapping the edges of sea ice. Barber said it's now up to governments to find solutions for climate change. "[Scientists] don't just write for each other. We have to write for the policy-makers," said Barber.